Today’ s story’ s about the multi-talented supermodel Grace Jones. 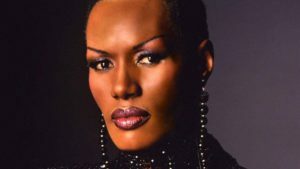 Grace Beverly Jones (born 19 May 1948) is a Jamaican-American supermodel, singer, songwriter, record producer, and actress. Born in Jamaica, she moved when she was 13, along with her siblings, to live with her parents in Syracuse, New York. Jones began her modelling career in New York state, then in Paris, working for fashion houses such as Yves St. Laurent and Kenzo, and appearing on the covers of Elle and Vogue. She worked with photographers such as Jean-Paul Goude, Helmut Newton, Guy Bourdin, and Hans Feurer, and became known for her distinctive androgynous appearance and bold features. Beginning in 1977, Jones embarked on a music career, securing a record deal with Island Records and initially becoming a star of New York City‘s Studio 54-centered disco scene. In the early 1980s, she moved toward a new wave style that drew on reggae, funk, post-punk and pop music, frequently collaborating with both the graphic designer Jean-Paul Goude and the musical duo Sly & Robbie. Her most popular albums include Warm Leatherette (1980), Nightclubbing (1981), and Slave to the Rhythm (1985). She scored Top 40 entries on the UK Singles Chart with “Pull Up to the Bumper“, “I’ve Seen That Face Before“, “Private Life“, and “Slave to the Rhythm“. In 1982, she released the music video collection A One Man Show, directed by Goude. Jones appeared in some low-budget films in the US during the 1970s and early 1980s. In 1984, she made her first mainstream appearance as Zula in the fantasy-action film Conan the Destroyer alongside Arnold Schwarzenegger and Sarah Douglas,. She subsequently appeared in the 1985 James Bond movie A View to a Kill as May Day. In 1986, she played a vampire in Vamp, and acted in and contributed a song to the 1992 Eddie Murphy film Boomerang. She appeared alongside Tim Curry in the 2001 film Wolf Girl. For her work in Conan the Destroyer, A View to a Kill, and Vamp, she was nominated for Saturn Awards for Best Supporting Actress. In 1999, Jones ranked 82nd on VH1‘s 100 Greatest Women of Rock and Roll, and in 2008, she was honored with a Q Idol Award. Jones influenced the cross-dressing movement of the 1980s and has been an inspiration for artists including Annie Lennox, Lady Gaga, Rihanna, Lorde, Róisín Murphy, Brazilian Girls, Nile Rodgers, Santigold, and Basement Jaxx. In December 2016, Billboard magazine ranked her as the 40th most successful dance artist of all time. And here’ s what I found on FashionTV, the world’ s most influencing fashion & lifestyle media. I wish you a beautiful Thursday and come back tomorrow with a new story.